Inspired in a museum, drawing memories of a journey or scribbling at the restaurant. 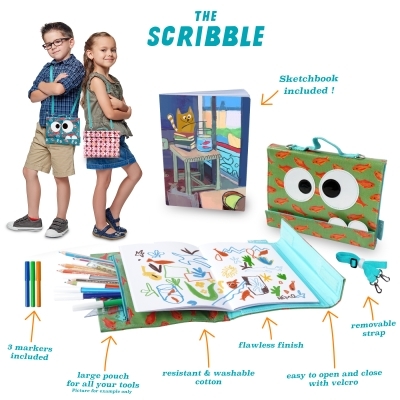 Bring the Scribble everywhere! Easy to open and close, it features a large pouch for your favorite drawing tools and a lovely sketchbook. This is so cute. I like the probability and the design. Seems easy to clean. This design is beautiful! The quality and detail are superb. I love all the different styles and prints that these come in. Any little artist would love to add this to their collection so they whenever their creative juices are calling they are ready. love the different choices for the cover I do think it would appeal to girls more than boys. how do you get more sketchbooks? It would not last long, colorful and eye-catching and love the long carrying strap.